Grover Norquist has been called "the most powerful man in Republican politics" — even by critics. Now the founder and CEO of Americans for Tax Reform has his hands full as he fights to keep Washington's big spenders from hiking taxes. Norquist's no-holds-barred Taxpayer Protection Pledge commits candidates to sign over their political souls — and protect citizens from rising taxes. And he's holding candidates to it. 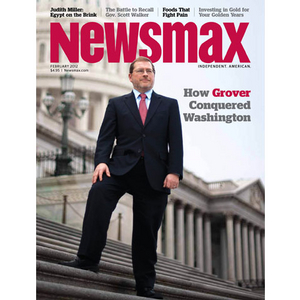 Newsmax magazine's special report "How Grover Conquered Washington" offers an in-depth look at Norquist and his anti-tax organization ATP, his critics and admirers, and the pledge that observers say has "transformed American politics," plus exclusive interviews with Grover. Harry Reid: Norquist leading Republicans "like puppets"
How Norquist dealt with "Grover's Gridlock"
Professor Ferguson’s special report is followed by a companion piece, “America, What Lies Ahead,” by the noted futurist and Pentagon consultant Dr. Marvin Cetron. Dr. Cetron projects future scenarios on a range of key issues, including national security, technology and vital resources — that will affect your life, wealth and family for the next generation. Dr. Cetron reveals why water and oil will be the major resources wreaking havoc across the global economy, why computers actually don’t create jobs, and whether another financial meltdown is around the corner. 'Grover Norquist' Newsmax Magazine February 2012 Grover Norquist has been called "the most powerful man in Republican politics" — even by critics. Now the founder and CEO of Americans for Tax Reform has his hands full as he fights to keep Washington's big spenders from hiking taxes.